Split into 3 groups of 6. Each team has two balls. Desginate a player on each team to give out numbers to each player. Players pass ball in sequence. Progression is as follows. Attacking players must stay outside of grid. Players play 2 touch. Defending partners must stay for 2 minutes. 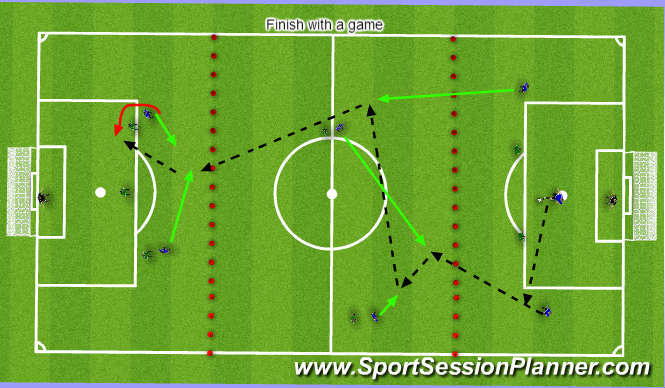 3 Grid Game: Player try to make 5 passes before trying to play to furthest zone. If ball is lost , attackers become defenders and defenders become attackers. Divide field into thirds. 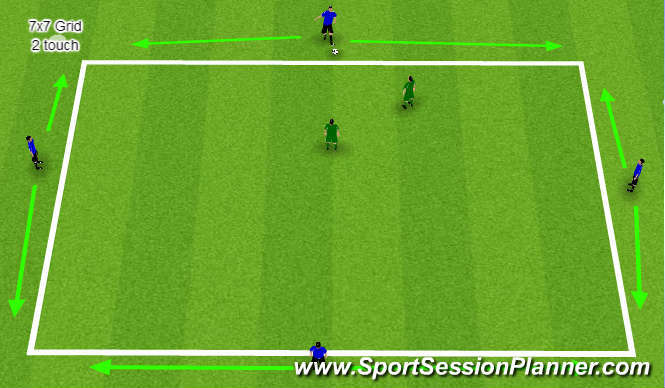 Play each team in a 3-2-2. Attacking wise, players may move up one third in attack except for forwards. Defending wise, players must stay in their own zone. Defenders are only attacking players that can leave their grids in attack. MFs must stay and move ball between the thirds.